The Research Data Alliance (RDA, https://rd-alliance.org) has, over the past five years, evolved into a community of over 6,900 individuals from 122 countries, with 50% of members coming from Europe. It builds social and technical bridges that enable open data sharing with the aim of researchers and innovators openly exchanging data across technologies, disciplines, and countries to address the grand challenges of society. The unique community-driven and bottom-up approach of RDA has been reinvigorating the research data landscape worldwide since 2012. Zooming in at a European level, the RDA Europe 4.0 project supports a series of national nodes to foster adoption of RDA outputs in the region, and thereby enable interoperability and data sharing on a global scale. The scope of RDA Europe 4.0 is to become the centrepiece for an EU Open Science Strategy through a consolidated European network of National Nodes, bringing forward the RDA legacy in Europe, providing skilled, voluntary resources from the EU investment to address Digital Single Market issues, also through a dedicated open cascading grant process. Athena, the Greek node, together with UK Science and Technology Facilities Council (STFC) provide Secretariat Support to RDA. BSC, the Barcelona Supercomputing Centre, supports Industry activities. The Italian node CNR-ISTI (National Research Council) provides editorial support for the Data Science Journal, while DANS, the Dutch Data Archiving and Networked Services acts as the RDA ambassador for the Social Sciences and Humanities (SSH) research communities. The Finnish IT Centre for Research (CSC - Tieteen Tietotekniikan Keskus), the German Max Planck Institute, the French CNRS (Centre National De La Recherche Scientifique), and the National Library of Ireland complete the initial network of nine pan-European Nodes. In practical terms, European Nodes facilitate the work of RDA in many ways. They promote open calls for European participation in RDA events and initiatives, organise meetings and hands-on workshops to showcase RDA outputs to promote adoption and lower language/cultural barriers. In order to become a node, organisations must apply for a grant to set up and manage a new RDA EU National Node, and develop and implement a broad-based and representative action plan aligned with RDA global vision and with national and European Digital agendas. Do you fit the criteria of becoming a national node? Stay tuned on https://rd-alliance.org to get notice about the forthcoming calls for the cascading grants. 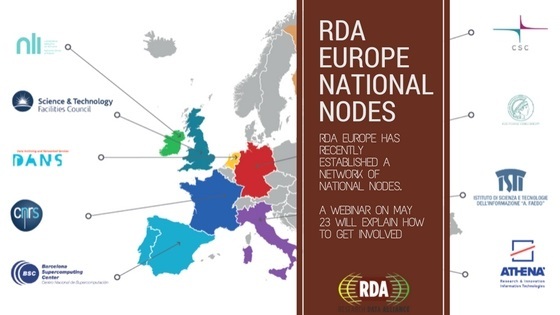 A webinar on 23 May will tell you more about the application process for becoming a new RDA Europe node. Visit the webinar page https://rd-alliance.org/webinar-what-rda-europe-node-and-how-get-involved to register your interest. You may also contact us at nodes@europe.rd-alliance.org for more information.